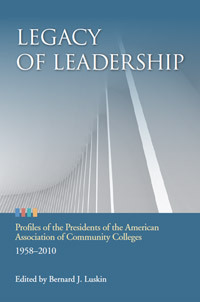 The book, Legacy of Leadership describes the contributions of the American Association of Community Colleges (AACC) presidents from 1958-2010. In writing the book, personal interviews and communications were conducted with the former presidents themselves. Legacy of Leadership emphasizes the special role that the Kellogg Foundation and these leaders played in the dramatic creation and expansion of community colleges. It chronicles community college evolution from being called the American Association of Junior Colleges, through the American Association of Community and Junior Colleges, to the present American Association of Community Colleges," Luskin explained. "Legacy of Leadership represents part of what was learned through the KCCLLP. In addition, our research revealed that the Kellogg Foundation funded more than five-hundred-and-fifty fellows. Many of them became major community college leaders who established best practices now used among colleges worldwide. Notably, several thousand additional leaders emerged from the community college leadership programs in universities supported by the Kellogg Foundation," Luskin added. "Forming the governance structure and establishing a "toehold" in federal legislation represents a significant accomplishment of which I am proud," said Edmund Gleazer. "Believing in community colleges and being able to highlight and serve a neglected majority was central to my goals as president," stated Dale Parnell. "My opportunity to focus on emerging technology and enhancing the place of community colleges among the many higher education associations that reside in the National Center for Higher Education is an objective we achieved, of which I am proud," added David Pierce. "Building on the clear and dramatic contributions of my predecessors and globalizing the community college is an accomplishment that was central to my objectives," expanded George Boggs. "Dr. Russell Mawby, Chairman, Emeritus of the W.K. Kellogg Foundation and Dr. Robert Kinsinger served as key advisors from the beginning of the project and throughout its publications. They deserve special recognition for their years of service and support of community colleges. Legacy of Leadership explains how this fifty-year period of growth of community colleges began," said Luskin. "Some of what is included is a previously little-known story," he noted. "To help with the work, the Kellogg Foundation supported an additional five special Kellogg Fellows who, as Fielding Graduate University doctoral students, worked with me on the project," added Luskin. "The insights from the KCCLLP are foundational to new master’s and doctoral degree programs in Organizational and Leadership Psychology, Media and Communication Psychology and Community College Leadership programs," adds Dr. Ira Krinsky, V.P. of Korn-Ferry International, the nation’s leading education executive search firm. FOR MORE ARTICLES BY DR. LUSKIN, PLEASE CLICK ON "ARTICLES" LOCATED ON THE MENU ABOVE. The convergence of media, technology, communication, art and science is transforming our world, and the socio-psychomedia effect is as enveloping to our society as water is to fish in the sea. Universities have begun to respond to our changing world with fresh approaches to help professionals develop mastery of new and emerging fields. New career opportunities abound, and new types of positions are emerging. Burgeoning media industries have an accelerating need for capable media professionals, solutions architects, and highly-developed practitioners who understand both psychology and state-of-the-art technology such as writers, producers, programmers, engineers, designers, directors, artists, cinematographers, public relations, and advertising specialists. Today’s educational institutions need faculty and staff who understand higher concepts in media arts and sciences. Our new tools are both physical and intellectual, with an understanding of psychology being central to the most effective use of new media in society. Individuals must understand implications of media to perform competitively in the majority of new and emerging occupational specialties. The study of media effects and understanding the psychology of media are fundamental to emerging trends. This article offers an overview of new developments in media studies, and the emergence of media psychology as a rapidly evolving field of advanced study. Media Studies programs are emerging in a variety of ways, and universities are launching new programs. All media manifests itself in communication, and effective communication requires an understanding of human behavior. Media Studies is the field covering the broad study of media effects. The area of research examines where psychology and media elements converge. Media psychology is related to Media Studies, much as arithmetic is related to accounting. Several of my students have recently completed their doctoral degrees in psychology with an emphasis in Media Studies. Dr. Jeanette Elliott, one of this group of outstanding scholars, has a description of 13 major U.S. and international Media Studies programs that may be seen in the full text version of this article on the CPA website at: www.calpsychlink.org. 1. Writing about media or performing as expert guests on various media. 2. Consulting with media personnel. 3. Researching ways to improve all forms of media. 4. Making new technologies related to media more effective and user friendly. 5. Using new technology in media to enhance clinical psychology. 6. Most areas of education or training. 8. Working in commercial fields. 9. Studying sociological and psychological media effects. 10. Developing materials for physically and developmentally challenged populations, as well as all underserved populations. 11. Working with deviant or criminal populations. The Fielding Graduate University (www.fielding.edu) School of Psychology offers the first PhD program in Media Psychology in the United States. The program focuses on the applications of psychology to multi-media and media effects. The School of Education also offers an Ed.D. that may include Media Studies tailored to programs customized for those who wish to focuses on higher education, community colleges, K-12, corporate training or other specializations. Media psychology embraces "pscybermedia", a neologism that combines psychology, artificial intelligence (cybernetics), and media. Media psychology also includes an understanding of both physical and emotional aspects of the brain, range of emotion, the psychologies of expression, persuasion, sexuality, and gender. It encompasses study of theories of emotional control, believability, situational cognition, assessment, learning, mapping, feedback, reinforcement, mastery, persistence, success, and failure. Media psychology is both an art and a science that embraces teaching, theory construction, research, application, and performance as they pertain to the production and to the processing and impact of mass communications and entertainment media messages on individuals, groups, and societies. It views these impacts in terms of sensory and cognitive processes, as well as larger group and individual effects related to cultivated or instigated behavior, attitudes, and values. The wide and exciting realm of effects research (how various news and entertainment media effect and are affected by audiences, audience demographics and audience numbers) is central to media psychology. Examples of such influences would be formation, maintenance and/or change of individual and group stereotypes, on-camera and off-camera diversity and its effects on media stories and media perspectives, advertising and propaganda messages, and learning and utilizing new skills and information. Another dimension of media psychology in the applied realm involves the appearance of psychologists in various print, electronic, and computer-based media, and their presentations of information about, and clarification of, the entire discipline of psychology. This group includes psychologists who consult with the media on various topics, psychologists who produce products for the media (such as books, films, magazine articles both on and off-line), psychologists who appear on radio or television in various guest and host capacities, and psychologists who offer on-line services such as education, advice and counseling information. A third dimension of media psychology concerns those who work with and within the government, business, and learning industries in the never-ending process of adapting hardware and software to various goals of information communication, and those who apply psychology in a variety of fields including commerce, education, entertainment, government, health services, and telecommunications. Multi-media presentations in institutional settings, the pursuit of commercial opportunities, innovations in remote or distance learning for educational and corporate university populations are also part of this dimension. • Synesthetics: The study of stimulating and combining one sense with another. • Semiotics: Communication through identification, manipulation, and use of symbols including screen design, iconography, navigation and user interface. • Semantics: Understanding the use, effects and implications of words. An understanding of synesthetics, semiotics and semantics is pivotal to the relationship between media, the human response, and the evolving language of this new field. New vocabulary, such as emoticon, screenager, webhead and cybrarian are examples of emerging terms and changing language. The field of psychology is rapidly evolving and expanding. Most of the emphasis over the years has been on Clinical Psychology as an area of key importance. As the broader aspects of psychology gain attention, a new vision of the scientist practitioner is emerging. Building programs in psychology that offer new opportunities in health services, public service and public policy, publishing, education, entertainment, and commerce opens a world of potential for those whose foundational understanding of psychology is sound. The concept of the scholar practitioner is interesting to contemplate. It is logical that those who are highly educated in understanding the mind and human behavior are well suited to assume key positions to help the world solve its problems and to capitalize on its opportunities. In education, coupling psychology and media will contribute significantly to the field of educational psychology. In public policy, such knowledge will be central to the dramatic socio-psychomedia world in which we live. All fields will be affected. Thucydides, author of The History of the Peloponnesian War, written in 431 BC, is reputed to have said, "A nation that draws too broad a difference between its scholars and its warriors will have its thinking being done by cowards, and its fighting done by fools." About the Author: Dr. Bernard J. Luskin received his doctorate in Education, Technology, and Psychology from UCLA and is Director of the Media Studies and Media Psychology Programs at Fielding Graduate Institute in Santa Barbara, California. 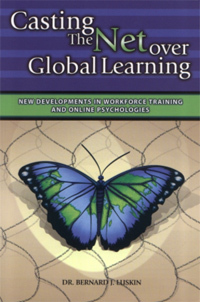 His newest book is Casting the Net Over Global Learning (20030. Luskin is Executive Vice President of Fielding Graduate University, and was Founding President of Coastline College, Founding Chancellor of Jones International University, President of Orange Coast College, Mind Extension University and Knowledge TV. He has been recognized with distinguished alumni awards by UCLA, CSULA, and Long Beach City College; with distinguished leadership awards from the University of Florida and Council for Resource Development and received lifetime achievement awards for contributions in digital media by the European Commission and Government of Ireland. Dr. Luskin may be contacted at bernie@luskininternational.com. References are available from the author upon request.